Futris Review 2019: Is Futris a Good Hosting? Since 1998, German company FUTRIS has been offering web hosting and domain solutions, but it can also set up virtual or physical servers for you. German company FUTRIS is headquartered in Chemnitz. Since starting out in 1998, and now with more than 20 years of hosting experience, it has become a leading light in web hosting, domains, and servers. From shared web hosting plans for small and big businesses to virtual servers, SEO, and domain solutions, FUTRIS offers it all. This company has become associated with outstanding offers, excellent service, and 100% quality, and it is driven by the motto “Einfach. Weiter. Vorn!” which means to move forward easily and continuously. The FUTRIS website is in German. 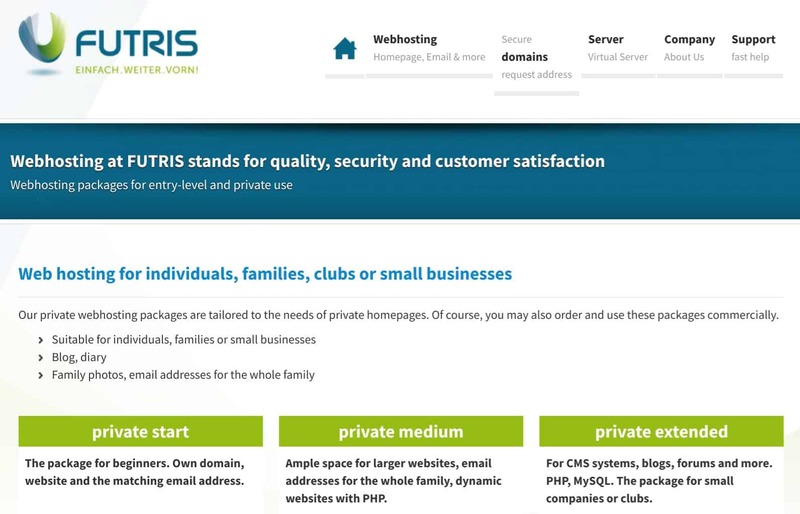 FUTRIS offers two types of shared hosting packages: Private and Business. Both types are further subdivided into the Start, Medium, and Extended tiers that differ in terms of storage space, domains, number of mailboxes, and MySQL databases. Private plans are best suited to individuals and small businesses. They come with one domain, 1 GB to 5 GB disk space, unlimited data transfer, 1 to 25 mailboxes, free SSL encryption, zero or one MySQL database, and processing of the contract in line with DSGVO (or GDPR) regulations. Business plans are more suitable for online shops and large websites that need to handle unlimited traffic and have higher demands for storage space and email accounts. FUTRIS houses its own servers in its partners’ state-of-the-art data centers. These servers are powered by modern multi-core processors and benefit from external backups plus RAID hard disks with an intelligent early warning system. FUTRIS offers affordable hosting plans that include a one-time setup fee, and the plans are payable monthly in euros via bank transfer or direct debit. You get SSL encryption for free. You can easily upgrade or downgrade your plan by contacting the company in writing. While new customers get a 30-day money-back guarantee, existing customers have 14 days to request a refund in writing. You can reach out to the FUTRIS support staff by phone, fax, email, or an online contact form. The alternative live chat was unavailable when I wanted to try it, and the exploratory email I sent remained unanswered. If you’re looking for reliable hosting solutions with reasonable prices from an experienced provider, FUTRIS fits the bill. Get award-winning hosting solutions from FUTRIS. Wondering how Futris stacks up against other Web Hosting companies? Enter any other Web Hosting company and we will give you a side-by-side comparison.